Paul Morgan Architects’ NMIT Student Centre, Epping, makes much-needed community services accessible for both students and the community at large in a dominant two-storey building on a major arterial road. The expanded services role NMIT Epping offers is symbolised by exposing the library, computer commons and gymnasium to public view. 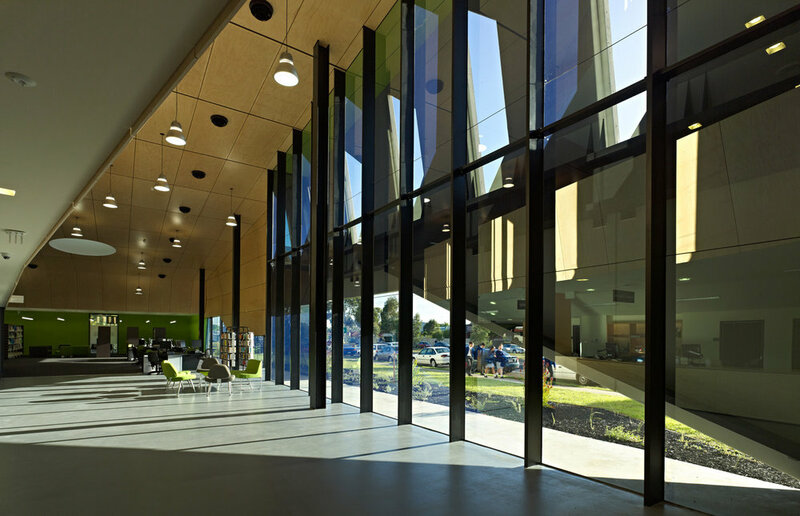 This building, for an educational institution in Melbourne’s outer north, makes much needed community services accessible for both students and the community at large. The NMIT Student Centre’s two-storey height and position on an arterial road in a suburb lacking civic buildings lends it a monumental quality. It symbolises the expanded services role NMIT Epping offers to the local community, exposing the library, computer commons and gymnasium to public view. The building’s east and west facades consist of a series of concave precast concrete panels that, in the manner of a carapace, protect the interior library space from undesirable street noise and harsh light. The angular, sloping windows at the south emphasise the building entry and focus interior vistas obliquely toward view corridors. Inside, the dramatic full-height glass, set back behind the pierced carapace, brings natural light into the entry foyer. Internal plywood cladding helps to define space and provide boundaries without compromising supervision. A central circulation desk allows librarians to survey students while greeting visitors. Teaching spaces are located in corners on the first floor and are filled with natural light. The building also incorporates a 24-hour technology lab for up to 36 students.